SpaceX is set to launch a pair of experimental internet mini-satellites after yesterday’s launch was cancelled due to high winds. You can watch today’s launch of the Falcon 9 live right here starting at 9:00 a.m. Eastern (6:00 a.m. Pacific). Update: The Falcon 9 successfully launched from Vandenberg Air Force Base in California at 9:17 a.m. Eastern (6:17 a.m. Pacific) earlier today. Insertion into orbit was successful, as was deployment of PAZ satellite to low-Earth orbit. The primary cargo of today’s launch is a 3,000-pound radar observation satellite, called Paz, owned by the Spanish government, but all the buzz is about the secondary load: a pair of SpaceX internet satellites dubbed Microsat 2a and 2b. They are the first of a planned 4,000-satellite constellation system called Starlink. 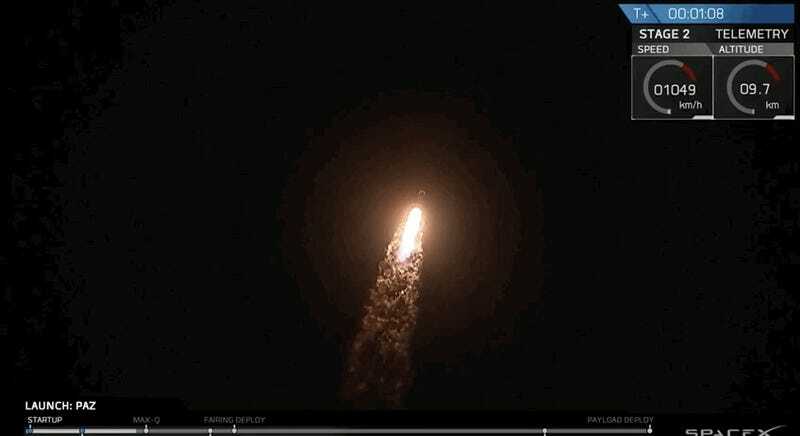 With today’s launch (finger’s crossed), the Elon Musk-led company will officially enter into the internet satellite business. 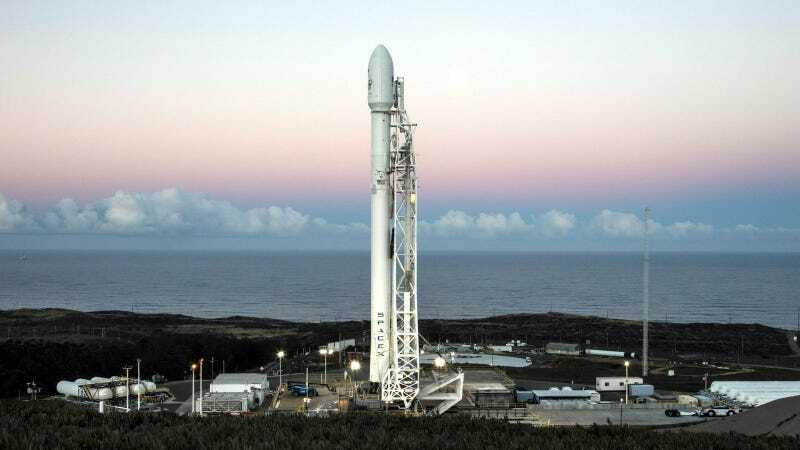 The cargo is packed atop a Falcon 9 rocket, which is scheduled to launch from the Vandenberg Air Force Base in California at 9:17 a.m. Eastern (6:17 a.m. Pacific), or shortly thereafter. The livefeed will go active approximately 11 minutes prior to launch, at about 9:00 a.m. PT (6:00 a.m. PT). The Falcon 9 was originally scheduled to go up this past Saturday, but SpaceX scrubbed the launch to perform more tests of the rocket’s fairing—the part at the tip that deploys the rocket’s payload. Parts of this Falcon 9 have been recycled from previous missions, including a first-stage booster used to launch Taiwan’s Formosat-5 satellite in August 2017, according to Space.com. SpaceX will not recover the the Falcon 9's first stage following the launch. First announced in 2015, Starlink is designed to be a massive, space-based telecommunications network involving thousands of interlinked mini-satellites. Musk has said that SpaceX is “going to try and do for satellites what we’ve done for rockets,” and the current plan is to have a low-cost global internet service in place by the mid-2020s. Revenue gleaned from the Starlink project could be used to fund eventual missions to Mars, according to The Wall Street Journal. This will be the first launch for SpaceX since the debut launch of its Falcon Heavy rocket, which delivered a Tesla Roadster and a manikin named Starman to space back on February 6. The next flight of a Heavy isn’t expected until June of this year. Correction: An earlier version of this post stated an incorrect estimated time for launch. We regret the error.